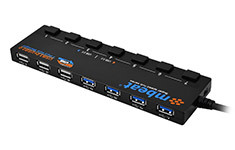 This 7 port hub has 4 x USB3.0 ports with data transfer rate up to 5Gbps and an additional 3 x USB2.0 ports for common universal 2.0 devices. The mbeat 7 port super speed hub manager has a stylish black slimline design with individual power switch to switch on/off the plugged in devices. Every mbeat super hub comes with a strong power pack to ensure the hub remains stable and speedy. An extra long cable is provided to reach your PC's USB port with convenience.